"Information is the ultimate weapon," this program proclaims. Based in New York City, Guerrilla News Network (GNN) is an independent news organization with a mission to expose young people to important global news and information free from corporate filters, through programming on the Web and on TV. GNN's news videos are 5 to 10 minute documentaries combining high-impact images, commentary by media experts, scholars, and political leaders with music cuts by top recording artists. 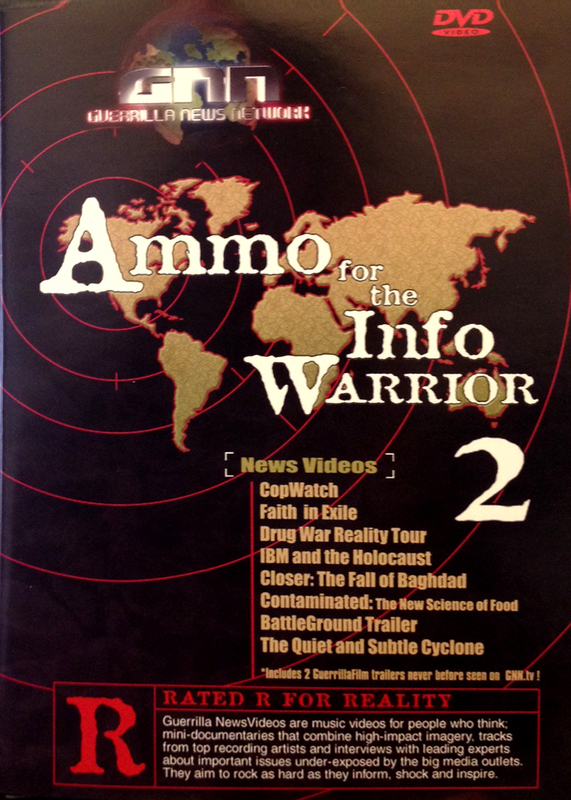 Ammo for the Info Warrior 2 features nine of GNN's most compelling news videos, including IBM and the Holocaust, CopWatch, and Closer: The Fall of Baghdad. Guerrilla News Network is an independent news organization with headquarters in New York City and production facilities in Berkeley, California. GNN's mission is to expose people to important global issues through cross-platform guerrilla programming. Josh Shore is a film/television producer, media/brand strategist, and developer of transformative enterprises. Prior to starting GNN, he created and produced assorted original television shows for USA Network, Showtime, MTV and MuchMusicUSA (now Fuse), in addition to producing and directing material for E! and Comedy Central. For Guerrilla News Network, he has split his time between producing and directing GNN media, working with different grant-makers to support the creation of original GNN productions, and developing various television initiatives that seek to bring the culture of GNN to a wider audience. Aside from his work in television and Web media, Josh has served as a strategist to various individuals, corporations and non-profit organizations, helping them to tailor their offerings, build out their brands, and develop new (r)evolutionary business opportunities. Headquartered in New York City, Josh is a graduate of the College of Arts & Sciences at the University of Pennsylvania. A writer and award-winning director, Stephen Marshall is the internationally-known creator of Channel Zero, the world's first global VHS newsmagazine. Distributed in Tower, Virgin and HMV record stores around the world, Channel Zero became an underground hit and one of the first successes of the small-format video revolution. In 1997, Marshall produced the provocative series The Electronic Eye: Canada as a Surveillance Society for the CBC's The National and consulted CNN Chairman Tom Johnson on the creation of a youth-based global news network. Since co-founding Guerrilla News Network in the summer of 2000, Stephen has directed over 15 short documentaries, many of which have been selected for film festivals around the world. In 2002, his Crack the CIA won its category at the Sundance Film Festival. Later that year, he was tapped by Interscope Records to direct animated videos for rappers Eminem and 50 Cent. In 2004, he wrapped production on two feature films: BattleGround: 21 Days on the Empire's Edge, a doc feature he shot, directed and edited about the American occupation of Iraq, and This Revolution, a political thriller starring Rosario Dawson, set at the 2004 Republican National Convention in New York. His first book, True Lies, co-authored with GNN's Anthony Lappe was published by Penguin/Plume in October 2004. "Sophisticated, hard-hitting and thought-provoking news videos that range from straight-on reportage to kaleidoscopic culture jams."